As a web developer, I spend a tremendous amount of time every day writing client-side code that runs in a web browser. I have made a huge investment in mastering these skills and keeping up with emerging trends and “best practices”. The declarative layout and rendering languages of the web, HTML and CSS, are widely known standards that for the most part work identically between platforms (albeit, with a few platform-specific idiosyncrasies). So, it makes perfect sense to me that HTML5 is the best solution for writing cross-platform apps. Since Windows 8.1 and Windows Phone 8.1 will share the same app model (as will the Xbox One, it was announced), the natural question is: Can I write my apps once and have them just work on each platform? The answer, for the most part, is ‘Yes’, using a new solution type called Universal Apps. Most of your application’s code will go into the Shared project. But, here’s where reality sets in: because a phone is different than a tablet/desktop, both in screen size, memory, and general platform capabilities, it is necessary to maintain some platform-specific pieces within their own project types. So, any artifact that exists in a platform-specific project will override the same file from the shared project at build time. No SettingsFlyout: In Windows 8.1 Apps, settings are maintained within flyouts that are accessed from the Settings Charm. This does not seem to be implemented on the phone, so you will need to find an alternative way for the user to specify settings, and refactor your codebase accordingly. You must set the msAudioCatogery before setting the src property in code. Though I am still experimenting, this seems to have greatly improved the lag situation (so explosions happen at the appropriate time, etc). 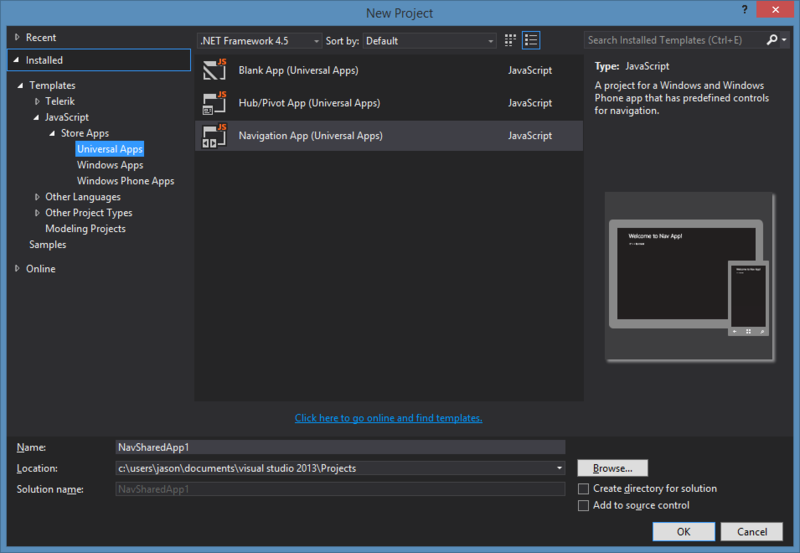 NuGet: Integration with NuGet seems a bit weird, if not incomplete. You can add a package to the platform-specific projects individually, but not to the shared project. And, NuGet itself seems to get confused, because even though the package is added to the packages folder, none of the artifacts (scripts, css, etc) get created within the project itself. 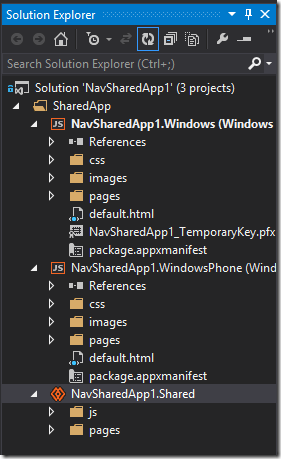 So, if there’s a library that I need to use in both places, what feels natural is to use NuGet to install the packages, and then use “Add Existing” to include files from the platform project’s packages folder into the shared project… but, this means that those artifacts are not truly maintained by NuGet. If there’s then an update to the package, then I’ll need to manually repeat the process. 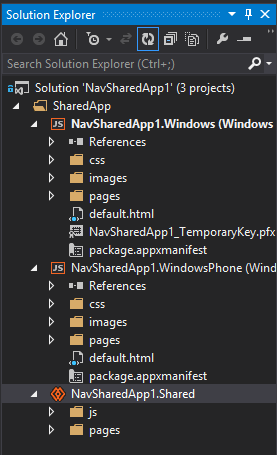 Windows.ApplicationModel.Store.CurrentApp.getAppReceiptAsync(): It seems, at least at the moment, that the XML returned from the Windows store differs from the XML returned from the Phone store. Specifically, the Phone document includes a default xmlns on the document element, while the Windows document does not (so, code that uses XPath queries will need to be handled conditionally depending on the platform).